The Hartley Planthouse is a free standing structure. This Opus Glasshouse is minimalist and extends the sought after feeling of light and space. Manufactured to customer specification this Modern Horticulture Greenhouse the sits on a low level brick wall. The new Modern Horticulture Greenhouse 7 is a free standing structure with a central entrance. This custom made greenhouse is part of a new, exclusive project in London’s East end. The appeal of greenhouses is undeniable. Virtually everyone enjoys the simple pleasure of connecting with nature, and greenhouses provide the perfect opportunity to do so. Shielding against unpleasant weather, damaging storms and high winds, planthouses are eternally peaceful – a safe haven for plants and gardeners alike. They offer us the chance to share natural beauty with loved ones, as they can be used as a tranquil room in which to entertain friends and family. Alternatively, they can serve as a quiet getaway, a rejuvenating place to indulge in one of life’s simplest, but most rewarding pleasures – gardening. However you use them, one thing is certain – The Modern Horticulture range is the ultimate in greenhouse design. Featuring concealed engineering, a streamlined finish and a flawless interior, these structures are a cut above the rest. 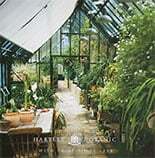 Lit by sun or moonlight, Hartley’s luxury, high quality greenhouses are more than just a place in which to grow, attend to and nurture prized plants, they’re a magical home away from home – a botanical haven for hobby gardeners, dedicated horticulturalists or anyone who enjoys the raw, organic beauty of nature. A free standing greenhouse from the Modern Horticulture Greenhouse range including integrated cold frames in light ivory. 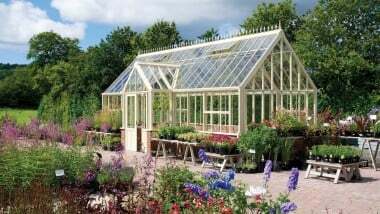 Superior specification sets this greenhouse apart from all others. A free standing Modern Horticulture Greenhouse 3 for growing and preserving plants. Launched at RHS Chelsea Flower Show 2016 Modern Horticulture Greenhouse 1 is a new concept.